Custom made for you from our own original art, please allow a little extra time - they are worth the wait! See notes at the end of the descriptions about delivery and no-return policy. Our yoga leggings and capris feature a wide waistband made from our micro-rib fabric. It is doubled up to produce the power needed to hold your leggings perfectly in place. Stitched in place with our elastane threads, your yoga leggings and capris are secure and ready to stretch with you. Designed with movement in mind, the double fold waistband is more comfortable than the classic elastic waistband and won’t let you down…even in downward dog! Stretch our fabric to the limit and it will bounce back and conform to your body even after multiple wearings. Our signature poly-spandex is soft yet supple and easy to care for. With prints that never fade and construction made to last, we want our printed leggings to be your go-to from yoga class or your daily jog, to dinner and dancing. Our signature poly-spandex is soft yet supple and easy to care for. With prints that never fade and construction made to last, we want our printed leggings to be your go-to from yoga class or your daily jog, to dinner and dancing. 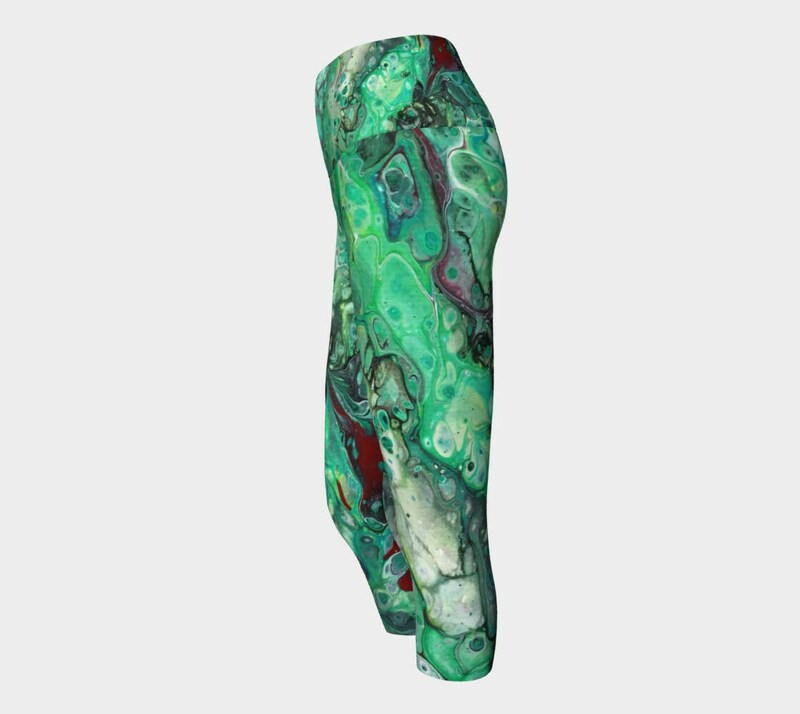 These custom artwork leggings are made in Canada, sweatshop free. 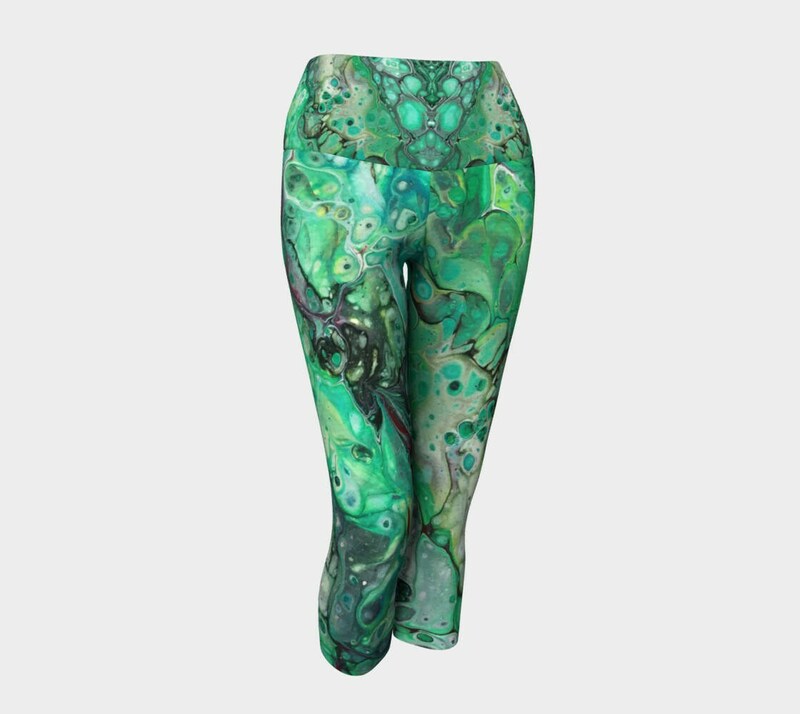 This wonderful production company put a lot of thought and development into how to make your custom leggings not only look good, but wear well and last long. Here's a bit from the manufacturer about how your custom pair of art designed leggings comes together. Every pair of leggings is printed and sewn by hand in Montreal, Canada. The fabric was also developed exclusively for the manufacturer and is made by a local Montreal mill. Compression fit due to our high spandex fabric. These leggings hug in all the right places and suit all kinds of body types. Vivid print that will never fade after washing. The ultra-stretch fabric holds shape even after multiple wearings. All these stretch fabrics feature an EcoPoly fiber. This fiber is considered eco-friendly since it requires significantly less energy and water use during manufacturing. We developed our own perfect legging fabric formula! When we set out to create our custom leggings, we started right down at the fibers! We searched out one of the last knit textile manufacturers in Montreal and sold them on our crazy idea to make custom leggings a reality. Our fabric is medium weight and sturdy, yet breathable, stretches to fit your body, hugs in all the right places and bounces back after washing. You can wear your leggings over and over and they won't lose their shape. After many months of testing for washability, endurance, and comfort, they developed their own perfect legging fabric formula. Now that we have the perfect fabric base to carry your artwork, we move on to getting the perfect print. 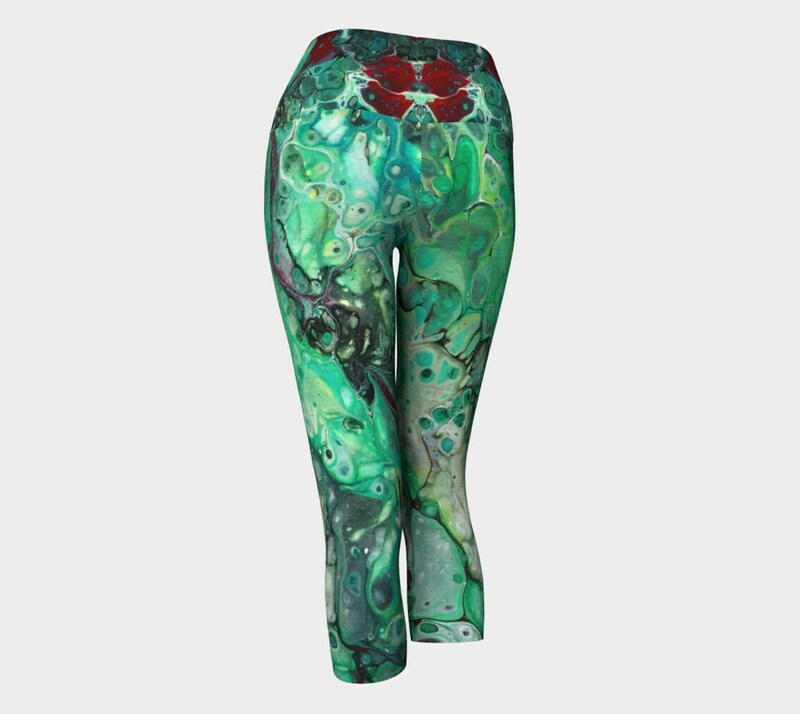 Our leggings are printed using solvent free sublimation inks. This printing method gives a vibrant, beautiful range of colors. We have worked with color specialists to provide the most accurate color matching to your original artwork as possible on fabric. And the most important part? Your printed leggings won't fade after wearing or washing! Your printed leggings are also easy to care for. All of our custom art products are made in Canada. That means when you place your order, they print your design onto their fabrics, then cut and sew your custom leggings. Each order is handled individually by hand by a specialized production team and is checked along the way for quality printing and sewing. They sew your leggings using a 4-thread overlock which incorporates a safety stitch along the seam for durability and stretch. This unique line is created from our own artwork. The fabric is printed individually for each piece, and custom made for that item. Please allow 2-3 weeks for delivery to US and Canada. Custom printed orders are non-refundable. If there is an issue with your order we will be happy to work with you to come to a solution. Please refer to our terms and conditions to see if the issue falls into our allowable range. Since all of our items are handmade, there may be variations between or even within an order.